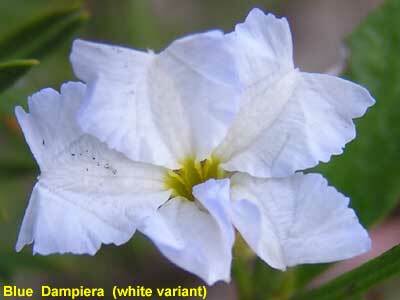 The Dampiera genus is named in honour of the English buccaneer William Dampier. In 1688 as a member of the crew of the Cygnet, and in 1699 as captain of the Roebuck, William Dampier landed on the west coast of Australia. It was on this second voyage that he collected plant specimens including the Sturt's Desert Pea. 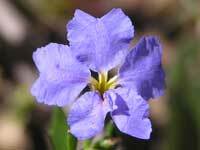 There are over sixty species of Dampiera - mainly in Western Australia. Dampiera stricta, presented here, is found in the eastern Australian states. 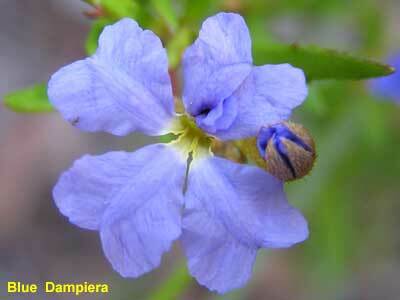 The name Blue Dampiera is not used in all references - most do not include a common name. It is a small plant usually around 25cm high, occasionally up to 50cm. Its 20mm flowers range from light blue through to purple. Its long flowering season - from winter through summer - and it being abundant, lets it add small pin pricks of blue throughout the open forests. Dampiera stricta is easily identified by its squashed diamond shaped leaves. 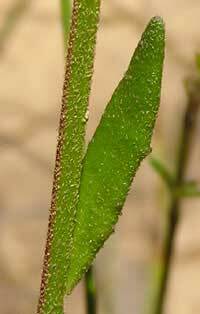 The leaf's corners having a soft small spike. Its leaves are rounder near the base of the stem, and may have two "corners" on each side making it more like a squashed hexagon. Although seeing thousands of these plants, I have only come across one plant bearing white flowers. However many plants have a white variant - such as the white form of the Pink Flannel Flower, the Pink Spider Flower and of course the White Waratah.